New York’s historic homelessness crisis, in which more than 61,000 men, women, and children go to sleep in shelters every night, demands bold solutions. Permanent rent subsidies – along with a significant increase in capital spending on new housing units for homeless individuals and families – are essential tools in helping people move out of shelters and into stable homes of their own. Today, the Coalition released a new brief, “Recovering from the Lost Decade: Permanent Rent Supplements a Potent Tool for Reducing Homelessness.” The report examines the history of both effective and ineffective rent supplements provided to homeless New Yorkers and offers recommendations to improve and expand proven solutions. Although Mayor de Blasio has taken some key steps toward reversing Bloomberg-era policies that essentially blocked the pathway out of shelters, the City must immediately bring effective solutions to scale to repair the damage of the “Lost Decade” in which virtually no Federally funded long-term rent supplements were provided to homeless households. Mayor de Blasio has the power to immediately help make up the deficit in stable housing placements accumulated during that “Lost Decade” by doubling the number of NYCHA units allocated to homeless families each year. The City should also continue to help at least 4,500 families and single adults annually move from shelters to permanent homes with City-initiated rent supplements, and ensure that all homeless households receive housing application and housing search assistance. The State must also play an important role in tackling record homelessness, by implementing the Home Stability Support long-term rent subsidy program, reinstating the Involuntarily Displaced Families program, expanding the Disability Rent Increase Exemption (DRIE) program, and increasing the amount of the Rent Subsidy for Foster Care Prevention, Reunification, and Independent Living to at least $600 per month. In a new report, the Coalition for the Homeless points to research indicating that families who receive permanent rent supplements—which Section 8 and NYCHA housing represent–“achieve housing stability and only rarely fall back into homelessness.” One of the problems with HSP and Advantage was that many families ended up back in shelters once the benefits ran out. De Blasio’s subsidy programs, like LINC, are better designed and, according to the Coalition, have helped reduce the rate of families returning to shelter. But by offering permanence, Section 8 and NYCHA are still seen as superior, and while de Blasio has re-established priority for homeless families to get those resources, he has not made as many slots available as there were before Bloomberg de-linked them. “There currently remains a deficit of 1,400 placements per year, compared with the pre-2005 levels. The accumulated deficit is now over 36,000 fewer Federally funded housing placements for homeless families since 2005 – a veritable Lost Decade that has undoubtedly contributed heavily to record homelessness in New York City,” the Coalition’s report reads. The group calls for the city to boost the number of homeless households given NYCHA placements to 3,000 a year. It also advocates for the state to approve Assemblyman Andrew Hevesi’s idea for a Home Stability Support program that would replace and expand the city’s LINC initiative and other voucher programs. The Coalition also recommends an increase in foster-care subsidies and a return to a 1990s program that set aside a share of vacant Mitchell-Lama units for the homeless. As he cruises toward re-election, Mayor de Blasio’s take on his own record on homelessness is that he has made some wise moves but took too long to understand the breadth of the crisis. Some homeless advocates would render the same verdict, at least when it comes to how the de Blasio administration has used the federal affordable housing resources at its disposal. 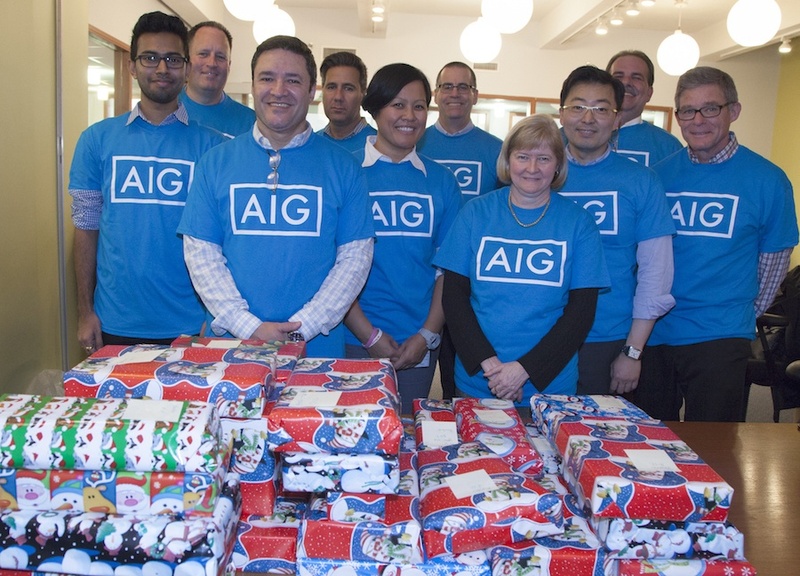 For the past six years, AIG has been one of the Coalition’s most committed corporate partners, lending their time, talents and financial resources to support the Grand Central Food Program, Camp Homeward Bound, First Step and our annual school supply and toy drives for homeless kids. 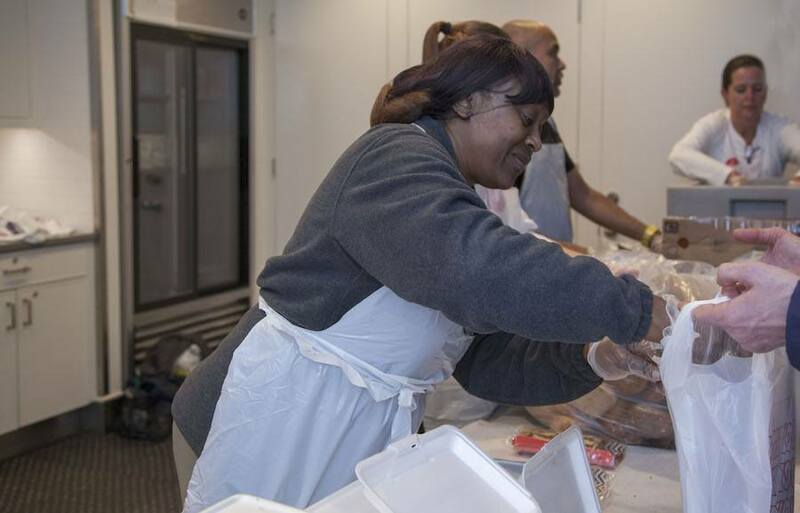 AIG has been the largest sponsor of our Grand Central Food Program (GCFP) Corporate Sponsorship Initiative since 2012, helping us deliver more than 150,000 meals to homeless and hungry New Yorkers. AIG’s employees have also played an active role in the program and have helped us deliver so much more than hot meals, including blankets, toiletries and warm clothing. AIG also sponsored 25 homeless kids to go to Camp Homeward Bound, and joined us for “Camp Clean Up Day” in June – when they nearly doubled their efforts from the previous year by bringing 80 dedicated volunteers up to Harriman State Park to clear the campgrounds and set up tents for the 300 girls and boys who attended camp this year. 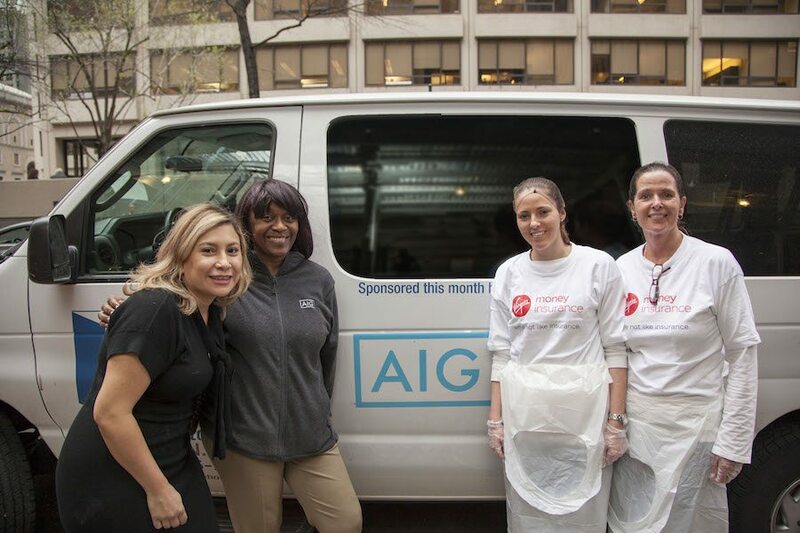 Recently, AIG also participated in a Corporate Day with our First Step Job Training Program for homeless and low-income women. During the afternoon, AIG employees provided useful resume tips and helped the women practice their interviewing skills as they prepared to enter the workforce. 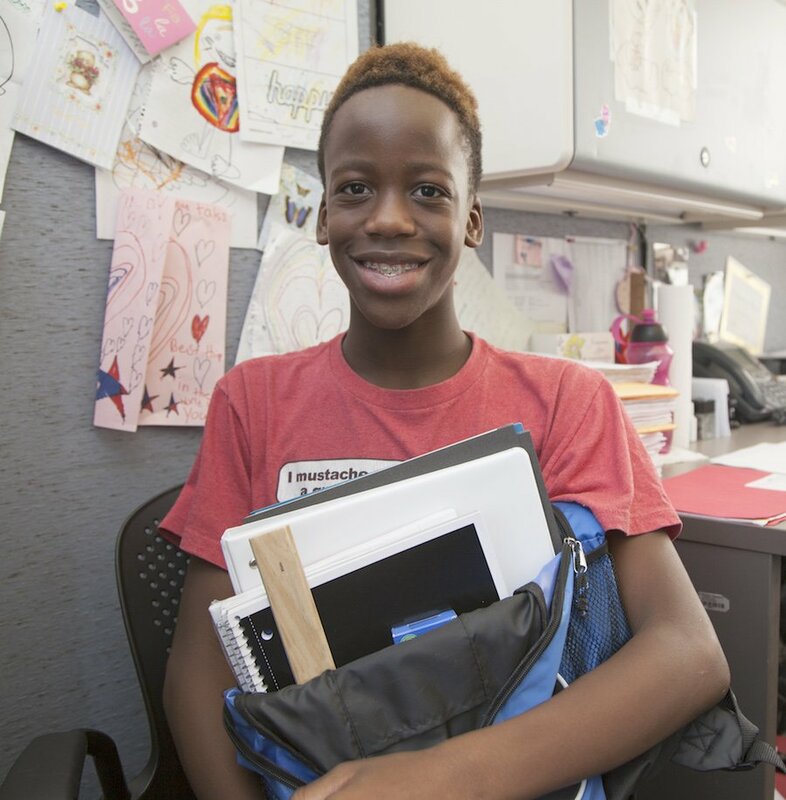 Prior to their official Corporate Sponsorship, AIG had been a proud supporter of the Coalition’s youth programs and our two annual drives – Project: Back to School and the Holiday Toy Drive. 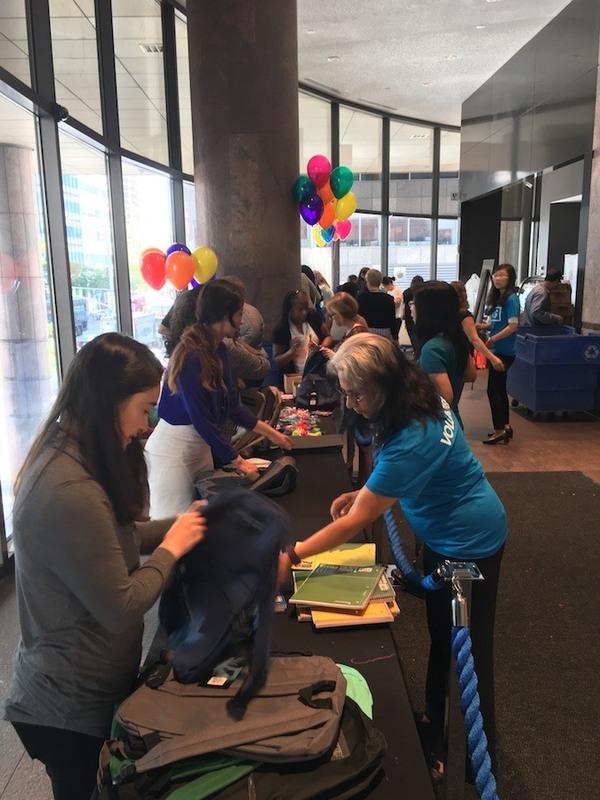 Last month, AIG staff members purchased enough backpacks and supplies for 1,000 kids, and spent a morning filling the backpacks with the pencils, binders, calculators and other school supplies for the kids. The drive wouldn’t have been the same – and we wouldn’t have been able to help so many homeless students – without them. We cannot begin to thank AIG enough for all of their support over the years. Through their efforts we have been able to deliver meals to tens of thousands of homeless people on the streets, give homeless and low-income women the critical skills needed to find living wage jobs, and ensure that homeless girls and boys have memorable summers, enriching academic experiences and magical holiday seasons. Learn more about how your company can get involved.